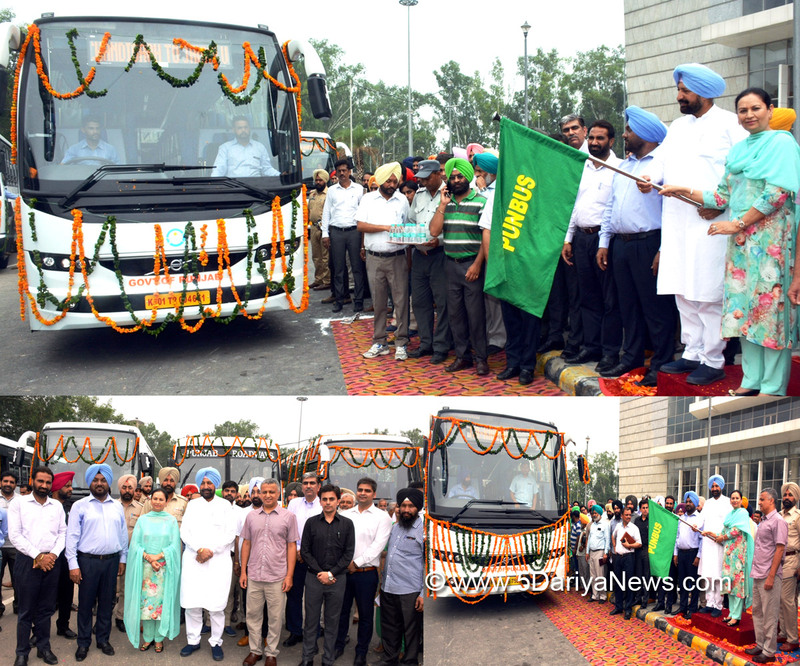 "The Punjab Government under the visionary leadership of the Chief Minister Captain Amarinder Singh is fully committed to provide better travelling facilities to the people of the state and it is in keeping with this mission that the Punjab Roadways/Punbus would add 333 ordinary and 31 super integral AC Volvo buses to its fleet by September 2018." This was disclosed by the Transport Minister, Punjab, Mrs. Aruna Chaudhary here today while interacting with the mediapersons after flagging off 10 AC Volvo as well as 4 ordinary buses from the Baba Banda Singh Bahadur ISBT during the first phase.Mrs. Chaudhary said that at present the fleet of Punjab Roadways/Punbus is equipped with 1844 buses including 1810 ordinary and 34 super integral coach AC buses. The minister said that the project of addition of the new buses would cost Rs. 104 crore and the old ones would be replaced in a phased manner. Adding more, the minister said that the Volvo buses would ply apart from various cities of Punjab on the Delhi Airport, Jaipur, Katra routes and from Chandigarh to Amritsar, Ludhiana, Pathankot, Ferozpur and Hoshiarpur routes. The minister also divulged that all these new buses would start operating by September 2018 end at the state and interstate routes.The minister also said that with the plying of new buses the transport department would add Rs.160 crore to its coffers per year and also with the commencing of operations by these buses the trend of illegal plying of buses by the private operators would be put to a stop. Aruna Chaudhary further added that the Transport Department has also decided to add under the Kilometer Scheme 31 ordinary and 11 super integral coach AC buses in its fleet which would soon be plying on the various routes. Adding more, the minister said that as part of the future plans under the Integrated Depot Management System all the depots of the Punjab Roadways would undergo computerization at a cost of Rs. 21,27,00000 and the 1800 buses would see the implementation of the Real Time Passenger Information System besides E-Ticketing. The minister further elaborated that this would lead to the data bases of the ticketing machines and online reservations and counter booking data being brought on a single platform resulting in the facilitation of the public and financial gain to the department.On the occasion, the Animal Husbandry, Dairy Development and Labour Minister, Punjab, Balbir Singh Sidhu said that the addition of new buses would provide better travelling amenities to the people while also saving time. Adding more, he said that the city bus service would soon make its debut in S.A.S. Nagar and the project is in the final stages. This would prove beneficial to the city residents and the people coming from outside too.Among others present on the occasion included Principal Secretary, Transport, Punjab, Mr. Sarvjit Singh, Director Transport Mr. Bhupinder Singh Rai, Political Secretary to Mr. Balbir Singh Sidhu----Mr. Harkesh Chand Sharma Machhli Kalan, SDM Mr. Jagdeep Sehgal, District Social Security Officer Mr. Ravinder Singh Rahi, General Managers of the various depots of Punjab Roadways and officers of the transport department.